My oldest son went to Duke. My middle son is a senior at UNC-Chapel Hill. As you can imagine, we are big time college basketball fans. We bleed two different shades of blue around here. Yes, I cheer for both teams. And now may I present something that will likely never happen again. Of all the brackets in the house, mine was the best. I finished in the 99th percentile! I didn't do any score predicting, but I sure am proud that I predicted the Final Four match-ups. 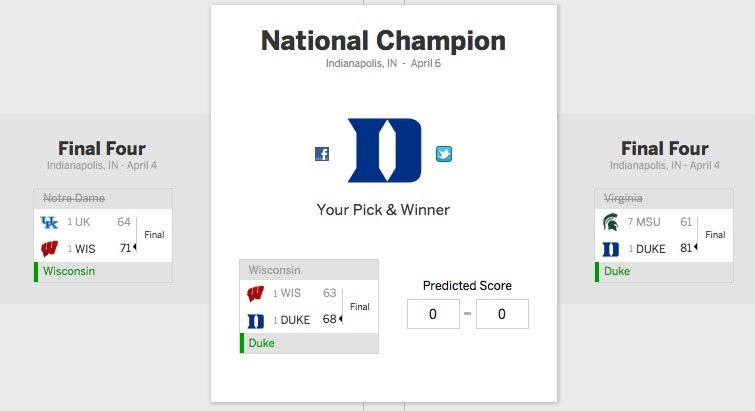 And of course I had to choose Duke to win. We moved to North Carolina in 2002. Since we've lived here, we've celebrated one national championship with Duke and two with UNC. I'm blessed to be able to cheer for both teams, since one of our sons went to Duke and one to UNC! Today, though, I'm especially grateful for what a fun NCAA tournament this has been. ACC teams did themselves proud throughout the tournament. It all came down to a great Final Four with awesome teams. We lived in Michigan for seven years and Tom Izzo is one of my favorite coaches, so I'm proud that Michigan State made it to the Final Four. Lots of my loved ones are Kentucky fans, so my hat is off to that team, and I think they should be remembered for their amazing 38-win season, not for their one loss. And the Wisconsin Badgers are a wonderful team. How can you not be a college basketball fan today? Now if I could just get a little sleep! Did you follow the NCAA tournament? Very impressive. Bet your boys are talking about you. I don't follow the NCAA at all. But all I could think is...you lived in Michigan?...that would be interesting to read about! Congrats to you! How fun! I don't have a set favorite, but I usually pull for the underdogs. I was happy for Wisconsin finally making it back to the championship game after 70+ years. wow!!! My bracket wasn't nearly as good....However, I did pick DUKE! I have always been a Blue Devil fan!! You are so funny! Isn't great that we can have a passion for a sport and for the Lord too? Mine is football and I the draft is coming up soon. Woot! We live the March Madness lifestyle! Not usually a basketball fan, but living next door to the University of Kansas (where bball was practically invented), you can't help but to become a Jayhawk! KU didn't go as far this year as we would have liked, but it was fun while it lasted. Happy for Duke!